They came in their thousands to help celebrate St George and have a rollicking good time as well. 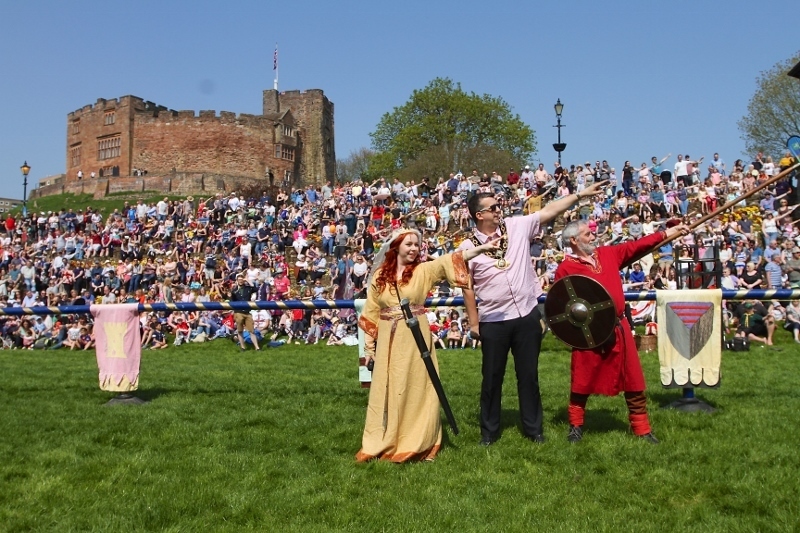 An estimated crowd of around 11,000 people flocked to the Tamworth Castle Grounds on Saturday 21 April for the annual St George's Day festivities. 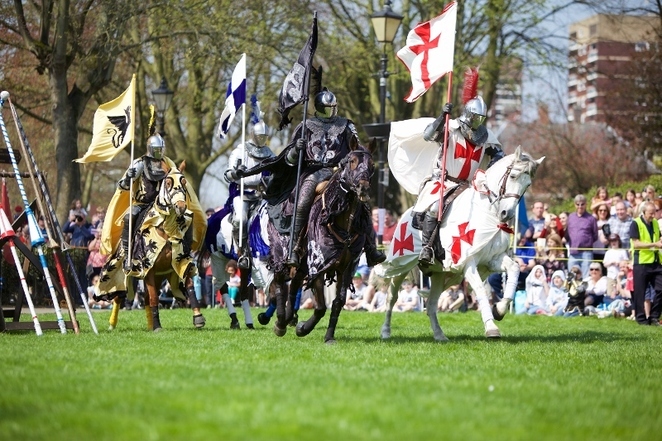 The sun shone for most of the day as visitors to the event enjoyed the medieval-themed fun and festivities on offer, which was highlighted by the appearance of St George and his knights. Families enjoyed free festival favourites such as jousting, archery, a living history camp, stalls, fairground rides and children's activities. In addition, there was an appearance by Beowulf – A Storytelling of Puppets and the return of Epico the last living dragon. This year's festival also included the new addition of The Tamworth Emerge Festival with a mix of dance, drama and music performances all inspired by Shakespeare. 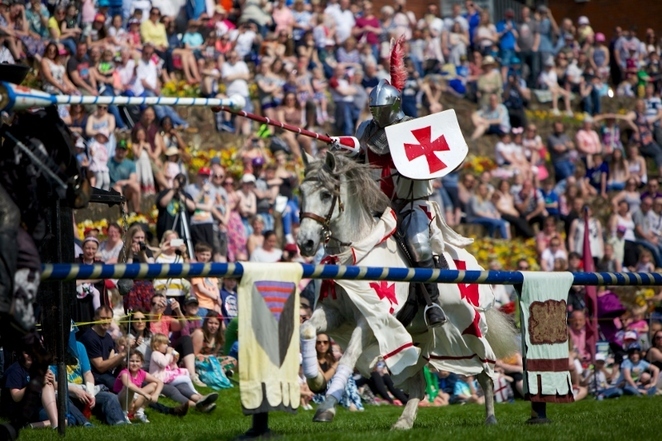 The popular Grand Medieval Joust again proved a firm favourite as the crowds gathered around the lower lawn to watch the action unfold as knights on horseback came to do battle in the main arena, performed by the Knights of Middle England group. This year's St George's Day event was also made extra special with the launch of a new social media campaign to celebrate the life of Tamworth's Anglo-Saxon warrior queen, Aethelflaed, who died in the town 1100 years ago this June. To celebrate, the St George's Day crowds joined together on the upper and lower lawn of the Castle Grounds to replicate the pose of a statue of the Lady of the Mercians due to be erected in the coming weeks and #DotheAethel. For more information on how to get involved, visit www.aethelflaed.co.uk. Other entertainment on offer included bungee trampolines, zorbing, fairground rides, food and drink, themed activities in Tamworth Castle and the dedicated Children's Zone, which was enjoyed by hundreds of children throughout the day. There was also a St George's Day parade of more than 100 Tamworth scouts who marched through the town centre before renewing their promise in the Castle Grounds. This year the event was sponsored for the first time by Mercedes-Benz of Tamworth, which was celebrating St George with a Facebook competition to drive a beautiful C Class AMG Line Cabriolet for one weekend. The free annual St George's Day festival is one of the highlights of Tamworth's impressive calendar of outdoor events organised by Tamworth Borough Council's Arts & Events team in partnership with Ankerside Shopping Centre. 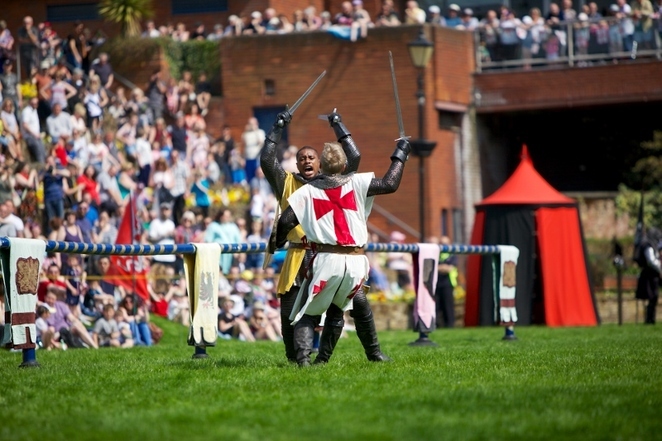 Andrew Barratt, Tamworth Borough Council's Corporate Director for Growth, Assets & Environment, said: "The St George's Day festival continues to be one of our most popular events and the Arts & Events team work hard to ensure it continues to live up to and even exceed expectations each year. It was great to see so many people enjoying the activities and entertainment on offer. It was also amazing to see the crowds joining in with the launch of the #DoTheAethel. The large attendance figure is great news and will hopefully help to draw more visitors to Tamworth town centre in the future."